Robert Hight gave John Force Racing its second-straight Funny Car victory of the 2012 NHRA season while Jason Line did the same thing for KB Summit Racing in Pro Stock Sunday at the Arizona Nationals on Sunday. Antron Brown also kept Don Schumacher Racing perfect as he won the Top Fuel portion of the event at Firebird International Raceway in Chandler, Ariz.
Brown got his victory when he beat teammate Tony Schumacher in the elimination finals. Brown’s winning pass came at 319.82 mph and in 3.973 seconds. Hight also had to beat a teammate to get his victory. That teammate was Mike Neff. Hight’s winning pass came at 307.02 mph and in 4.139 seconds. And, yes, line beat his teammate, Greg Anderson, who won the Winternationals last weekend, in the Pro Stock finals. The winning past came at 211.69 mph and in 6.558 seconds. The win moved Brown to the top spot in the Top Fuel standings, 32 points ahead of second-place Schumacher, who continued his winless streak to eight final round appearances. Schumacher’s last win came in Las Vegas in Oct. 2010. Fellow Don Schumacher Racing teammate Spencer Massey sits third after his second round appearance. In Funny Car, it was Hight’s first win at Firebird International Raceway and 24th win of his career. With the win Hight moved to second in the point standings behind teammate Neff. Team owner John Force sits third in the point standings, four points behind Hight. Force fell first round to daughter Courtney Force, who went on to her first career semifinal appearance. Defending Pro Stock world champion Line held off fellow KB Racing teammate Greg Anderson to secure his first win of the season. Line drove his Summit Racing Pontiac GXP to a 6.558 at 211.69 past Anderson to secure his 28th career win and first at Firebird International Raceway. With the win Line moved to second in the point standings, one point behind leader Anderson who made his second consecutive final round appearance of the season. Recent runner-up finisher Jeg Coughlin sits fifth in the point standings after his first round loss to Line. The NHRA Full Throttle Drag Racing Series will return March 8-11 for the Tire Kingdom NHRA Gatornationals presented by NapaFilters.com. Final finish order (1-16) for professional categories at the 28th annual NHRA Arizona Nationals at Firebird International Raceway. The race is the second of 23 events in the NHRA Full Throttle Drag Racing Series. 1. Antron Brown; 2. Tony Schumacher; 3. Shawn Langdon; 4. Clay Millican; 5. Steve Torrence; 6. Doug Kalitta; 7. Spencer Massey; 8. Morgan Lucas; 9. Brandon Bernstein; 10. Khalid alBalooshi; 11. Bob Vandergriff; 12. Troy Buff; 13. Cory McClenathan; 14. Terry McMillen; 15. Mike Strasburg; 16. David Grubnic. 1. Robert Hight; 2. Mike Neff; 3. Jack Beckman; 4. Courtney Force; 5. Jeff Arend; 6. Ron Capps; 7. Todd Lesenko; 8. Johnny Gray; 9. Bob Tasca III; 10. Tony Pedregon; 11. Cruz Pedregon; 12. Matt Hagan; 13. Grant Downing; 14. Jim Head; 15. Bob Bode; 16. John Force. 1. Jason Line; 2. Greg Anderson; 3. Greg Stanfield; 4. Rodger Brogdon; 5. Erica Enders; 6. Vincent Nobile; 7. Larry Morgan; 8. Mike Edwards; 9. Ronnie Humphrey; 10. Allen Johnson; 11. Kurt Johnson; 12. Warren Johnson; 13. Shane Gray; 14. Jeg Coughlin; 15. Ron Krisher; 16. Steve Kent. Top Fuel — Antron Brown, 3.793 seconds, 319.82 mph def. Tony Schumacher, 3.813 seconds, 318.17 mph. 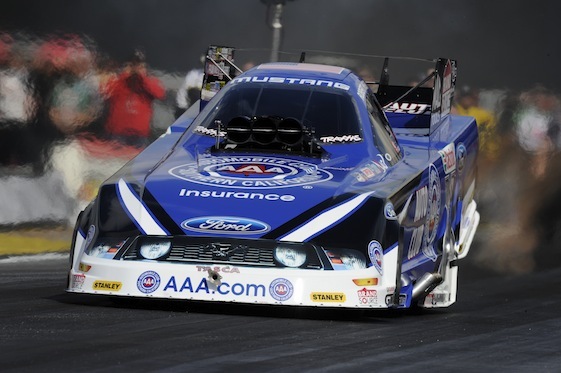 Funny Car — Robert Hight, Ford Mustang, 4.139, 307.02 def. Mike Neff, Mustang, 4.168, 309.91. Pro Stock — Jason Line, Pontiac GXP, 6.558, 211.69 def. Greg Anderson, GXP, 6.570, 211.06. Super Stock — Dan Fletcher, Chevy Camaro, 9.376, 144.04 def. Ken Etter, Plymouth Shadow, 10.166, 128.60. Stock Eliminator — Leo Glassbrenner, Pontiac Firebird, 10.571, 116.81 def. Brad Hawk, Ford Mustang, 12.671, 103.00. Super Comp — Greg Boutte, Dragster, 8.898, 174.71 def. Steve Whitfield, Dragster, foul. Super Gas — Michael Miller, ’27 Ford, 14.757, 84.36 def. Ed DeStaute, Chevy Corvette, broke. Super Street — Ray Dew, Chevy Nova, 10.874, 128.63 def. Ryan Herem, Chevy Camaro, 10.867, 132.65. Top Dragster — Tom Koenen, Dragster, 7.090, 189.39 def. JR Lobner, Dragster, 6.824, 196.99. Top Sportsman — J Wayne Silvia, Chevy Cavalier, 11.560, 101.09 def. Ted Carli, Chevy Cobalt, broke. FINAL — Brown, 3.793, 319.82 def. Schumacher, 3.813, 318.17. ROUND ONE — Jeff Arend, Toyota Solara, 4.117, 308.64 def. Jim Head, Solara, 5.417, 139.86; Mike Neff, Ford Mustang, 4.072, 309.13 def. Bob Bode, Chevy Impala, 5.960, 143.75; Johnny Gray, Dodge Charger, 4.084, 310.34 def. Grant Downing, Charger, 4.422, 217.28; Todd Lesenko, Impala, 4.264, 266.79 def. Matt Hagan, Charger, 4.325, 293.92; Courtney Force, Mustang, 4.146, 307.30 def. John Force, Mustang, 7.364, 91.30; Jack Beckman, Charger, 4.090, 308.57 def. Tony Pedregon, Impala, 4.179, 304.53; Ron Capps, Charger, 4.162, 301.13 def. Cruz Pedregon, Solara, 4.210, 274.33; Robert Hight, Mustang, 4.095, 308.85 def. Bob Tasca III, Mustang, 4.157, 302.28; QUARTERFINALS — Hight, 4.613, 241.97 def. Gray, DQ; Beckman, 4.172, 282.24 def. Arend, 4.322, 294.43; Neff, 4.264, 246.75 def. Capps, 7.000, 90.68; C. Force, 4.099, 306.95 def. Lesenko, 7.073, 93.02; SEMIFINALS — Neff, 4.099, 306.74 def. Beckman, 4.129, 301.60; Hight, 4.158, 304.32 def. C. Force, 4.199, 299.93; FINAL — Hight, 4.139, 307.02 def. Neff, 4.168, 309.91. ROUND ONE — Rodger Brogdon, Pontiac GXP, 6.617, 209.98 def. Ron Krisher, GXP, 7.125, 140.23; Erica Enders, Chevy Cobalt, 6.581, 210.54 def. Steve Kent, GXP, 8.753, 108.86; Larry Morgan, Ford Mustang, 6.581, 209.72 def. Allen Johnson, Dodge Avenger, 6.598, 210.97; Vincent Nobile, Avenger, 6.571, 211.26 def. Shane Gray, GXP, 7.003, 158.82; Greg Stanfield, GXP, 6.623, 209.20 def. Ronnie Humphrey, GXP, 6.592, 210.93; Mike Edwards, GXP, 6.567, 210.73 def. Warren Johnson, GXP, 6.634, 208.39; Jason Line, GXP, 6.549, 211.56 def. Jeg Coughlin, Avenger, 7.078, 156.92; Greg Anderson, GXP, 6.555, 210.83 def. Kurt Johnson, GXP, 6.618, 209.52; QUARTERFINALS — Stanfield, 6.636, 207.85 def. Morgan, 11.083, 77.23; Brogdon, 6.640, 208.68 def. FINAL — Line, 6.558, 211.69 def. Anderson, 6.570, 211.06. 1. Antron Brown, 212; 2. Tony Schumacher, 180; 3. Spencer Massey, 176; 4. Morgan Lucas, 143; 5. Shawn Langdon, 139; 6. Clay Millican, 126; 7. (tie) Steve Torrence, 89; Bob Vandergriff, 89; 9. (tie) Brandon Bernstein, 85; Doug Kalitta, 85. 1. Mike Neff, 196; 2. Robert Hight, 154; 3. John Force, 150; 4. Jack Beckman, 137; 5. Ron Capps, 125; 6. Courtney Force, 124; 7. Todd Lesenko, 102; 8. Johnny Gray, 99; 9. Jeff Arend, 84; 10. Gary Densham, 83. 1. Greg Anderson, 209; 2. Jason Line, 208; 3. Mike Edwards, 147; 4. Rodger Brogdon, 125; 5. Jeg Coughlin, 122; 6. Vincent Nobile, 111; 7. Greg Stanfield, 103; 8. Allen Johnson, 93; 9. (tie) Erica Enders, 84; Shane Gray, 84.